Sean performs live to professional backing tracks and entertains with smooth, easy-listening classics from Frank Sinatra, Dean Martin, Perry Como, Michael Bublé and many more, always at a non-intrusive level which allows people to tune in and out as they wish, to tap their feet or sway along with the music, often without realising they are doing so! 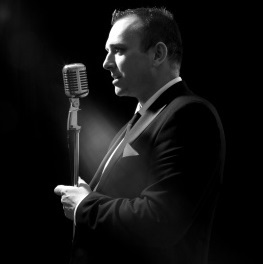 Always dressed in blacktie formal wear and using a vintage style microphone, Sean’s attention to detail puts the finishing touches to this timeless style, which is then presented to you and your guests as an audio backdrop rather than a focal point. To book Sean Boland or to talk to us about your corporate entertainment needs and budget, please submit the enquiry form or call us on 087 718 1360.